From an economist's point of view, the economy is a decentralized societal calculating machine. It looks at everybody, and tries, in a utilitarian way, to increase social welfare—which it roughly defines as summing everybody's well-being, with each person's well-being weighted by their lifetime wealth. This produces a system in which incentives are, and "doing well" achieved by, increasing resources that produce things for which rich people have a serious Jones. Finding an organization—a government or an NGO—that is willing to some degree to commit resources to bend this market logic of "to those who have, more shall be given"
Find some people who have skills and resources and industry that are somehow blocked from the sight of the world market, and figure out a narrow strategic intervention that will makes those resources visible—and hence valuable. Except the Times shou'd alter." Note to Self In response to EconSpark: Ben Bernanke: "How important was the financial panic as a cause of the Great Recession?" 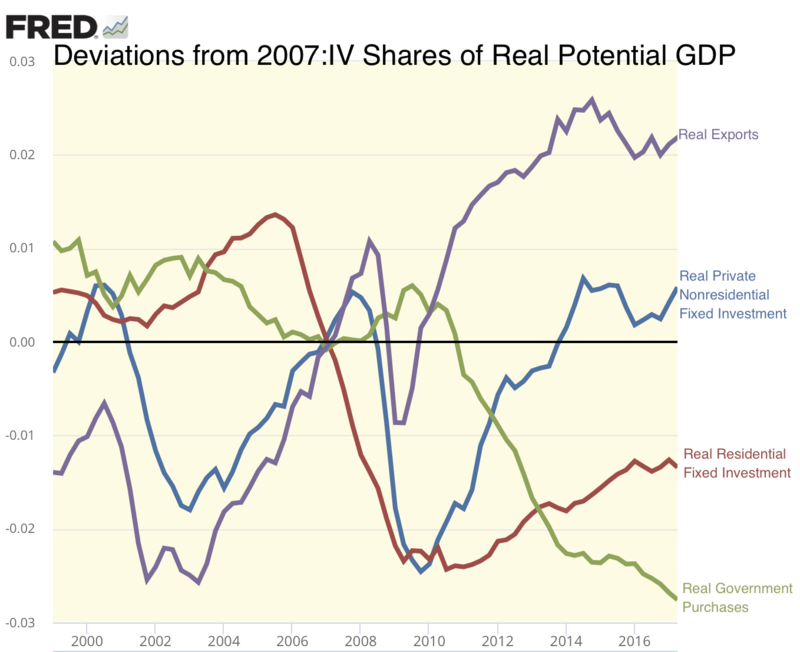 Real exports, real private nonresidential fixed investment, real residential fixed investment, real government purchases, all as deviations from their 2007:IV shares of real potential GDP. Yes, There Are Individual Economists Worth Paying Respect to. But Is Economics Worth Paying Respect to? Blush. To be one of fifteen good economists name-checked by Larry Summers genuinely makes my day—nay, makes my week. But this gets into a topic I have been worrying at for a long time now. And so let me try once again to say what needs to be said, for I do have to admit that, contrary to what Larry maintains, Fareed Zakaria does have a point when he says that "events have hammered... nails into the coffin of traditional economics" and that, while the question mark at the end is important, it is time to speak of "the end of economics?". Yes, there are very many good economists worth listening to. But does economics as a whole have any claim to authority, or is it better for outsiders' first reaction to be to dismiss its claims as some combination of ideology on the one hand and obsequious toadying to political masters on the other? Open right now on my virtual desktop, as has been true about 5% of the time over the past fourteen months, is an article forecasting the economic effects of the 2017 Trump-McConnell-Ryan tax cut by nine academic economists: Robert J. Barro, Michael J. Boskin, John Cogan, Douglas Holtz-Eakin, Glenn Hubbard, Lawrence B. Lindsey, Harvey S. Rosen, George P. Shultz and John. B. Taylor: How Tax Reform Will Lift the Economy: We believe the Republican bills could boost GDP 3% to 4% long term by reducing the cost of capital. It is, bluntly, unprofessional. The Shutdown: Let's review the bidding: Pelosi, Ryan, McCarthy, Schumer, McConnell, Trump reached a deal. Deal passes Senate unanimously. Trump watches "Fox and Friends". Trump announces he won't sign the deal. Paul Ryan—desperate not to embarrass Trump more—won't let the House vote on the deal. Ryan goes out and Pelosi gets in on January 4, and Pelosi passes the deal through the House. But because it is a new congressional session, the Senate's approval has expired. And McConnell—desperate not to embarrass Trump more—is now holding things up in the Senate.